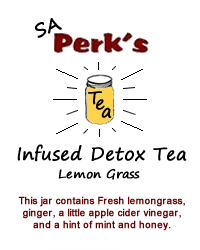 Fresh lemongrass, ginger, apple cider vinegar, and a hint of mint and honey. Heals colds and flu, great for your digestive system, BOOST METABOLISM AND BURNS FAT!!!!!! Loose leaf tea is from Whats Brewing SA.